Miscellaneous spelling and grammar problems. Thanks to Ian Kinney for helping with the proofreading and editing. A few graphic modifications, shading and linework tweaks. Hardcopies printed for miniature use should look better. Fixed a couple of low resolution illustration issues. A good number of geomorphs were tweaked - something I can't stop doing for some reason. Nothing major. There are fewer staterooms without private freshers. The image of crew members roaming the ship wrapped in a towel looking for a shower was getting to me. I was able to bring editable layers into the PDF but for some reason it was bringing down the graphic quality of just about everything, so I opted to leave out that feature until such time as I can do so without sacrificing quality elsewhere. My apologies to those who were hoping to have hex grids this round. Thanks to everyone for your kind words and encouragement. I hope you enjoy this cleaned up version. Very much cheers and thanks for your amazing works. Sure. If anybody has ideas for additional geomorphs I'm all ears. I've already got a list of suggestions from some other people. It will probably be a while before I print another PDF book, but I may post additional geomorphs to my blog from time to time. I was thinking of a geo that was 'Angled'. A wall/edge tat starts at one corner and 'slopes' to the centre of another edge. If this is not given some sort of gaming award then they may as well stop handing them out. Hi Robert, the items that I would suggest would be the following. (3) Standard drives ie type A jump, type C maneuver as you know the volume etc and players can use the drive/bridge/etc as drop in iems on either their own ships or as items on the ground at starports. (4) most important of all, a patreon account and or email address so we can send you a thank you for your efforts. Good ideas! I'm working on the starship "symbols" book now and can incorporate new bridge layouts and standard drives sizes into that. I've got a bunch of ideas for stateroom layouts and fittings that I want to address in a separate blog post.I think I'll need to do a bunch of illustrations to make it easier to understand, so that may be a while. Thanks! I've been using these for buildings more than ships so far (COTI image album has soe of the postings as does my Traveller blog). This stuff is just great. I love the clear lines - very classic Traveller for my sensibilities. Most excellent, can’t thank you enough. +1 on the gaming award comment! I noticed you have other 100 ton starships on page 6. Will they be reproduced as their own starship deckplans? Also will you be updating your starship compilation pdf? Also noticed that your Legacy starship doesn't have any freshers. I wanted some of the geomorphs to have access to full blow starships, but I most of designs I had didn't fit so I whipped up the Wraith, Ursus, and Legacy. My hope is that someday I'll be able to flesh them out to the extent that I do my other starship designs. 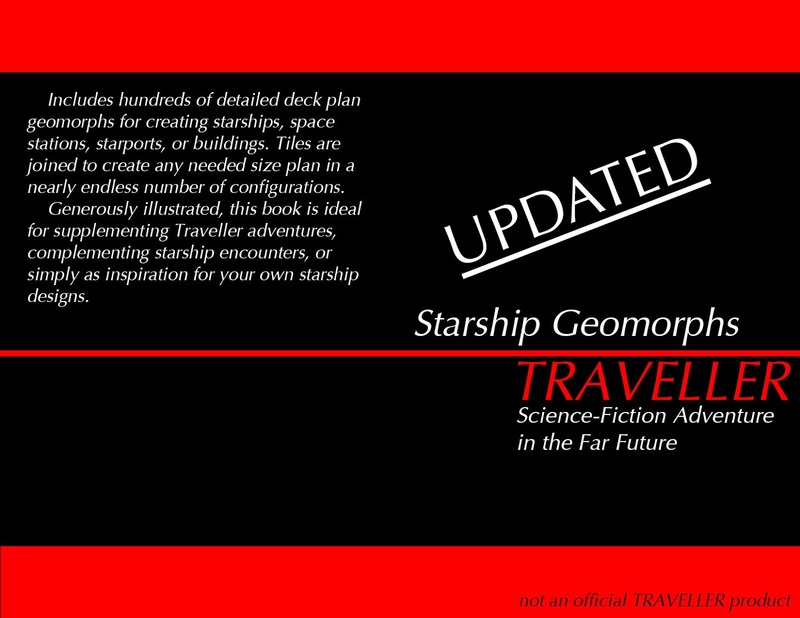 I probably won't update the starship compilation PDF, but once I'll continue to post individual ship deck plan PDFs and when I get enough of them I'll produce a compilation #2. Would you believe the Legacy Class is crewed by a group of robots? No? How about a bunch of sentient plants that only excrete CO2, so don't need a fresher? How about I just slapped the ship together too fast and didn't take the time to review it? That's probably more likely. Outstanding resource for game play. Would it be possible for you to publish the raw images so that they can be easily used with online games, such as through Roll20? The PDFs are fantastic as handouts but are difficult to use for full sized maps. Or, sell the raw images through the Roll20 Marketplace. There are no "raw" images as the PDF is printed directly from Autocad. Depending on your software, you might be able to save the PDF as individual JPG files, if that would work for you. Other than that, I would recommend just taking screenshots of the pages you want to use, and see if that works for you. Good luck!